Once we went on a pilgrimage to Kaveri Pushkaram and on our way back we stopped at Arunachala. There we were told that a young Brahmin saint had been living on the hill for the past ten years. The next morning we went up the hill along with others with whom we were travelling. At Mulaipal Tirtha we cooked our food, ate and had some rest. Then we went further and found the young Swami near Virupaksha Cave. There was a brick platform at the entrance of the cave and he was sitting on it. As soon as I saw him, I was at once convinced that God Arunachala Himself had come in human form to give salvation to all who approached Him. We returned to Nellore and the impression of that visit faded away. I did not even dream at that time that my life would be spent at the feet of the Swami. When I was thirty-one I went to Rameshwaram on a pilgrimage and on my return journey I stopped at Tiruvannamalai. I learned that the Swami was then living at the foot of the hill. That afternoon we went to see him at his Ashrama. There was a thatched shed over his mother’s samadhi and a tiled hall for meeting the Swami. He was seated on a couch and about a dozen devotees were on the bare floor. We sat in silence for ten minutes and returned to the town. The next day at noon I was again at Ramanasramam. His midday meal over, Bhagavan was reclining on the sofa and explaining a verse from the Bhagavad Gita to Sri Ramiah Yogi. As no one else was in the hall, I gathered courage and asked: “What is Atma? Is it the limitless ether of space or the awareness that cognizes everything?” Bhagavan replied: “To remain without thinking ‘this is Atma‘ and ‘that is Atma‘, is itself Atma.” He looked at me and I felt my mind melt away into nothing. No thought would come, only the feeling of immense, unutterable peace. My doubts were cleared. Every day I would visit Bhagavan and listen to his talks with the devotees. Deep in my mind there was the same rock-like stillness, immensely solid and yet strangely vibrant. Bhagavan was one day reading and explaining Tirupugazh in Tamil to Alamelammal of Madura. I did not know Tamil and I could only look on. I saw a change in Bhagavan. A light was shining from within him. His face was radiant, his smile was beaming, his eyes were full of compassion. His words reverberated in the mind and were instantly and deeply understood. All my being was carried upwards on a current of strange vibrations. The memory of this experience is ever present in my heart. A great joy has remained with me that I was privileged to sit at the feet of the Divine Being. It was ever like this with him. Whoever went to him, he would go down to his level; his words and gestures, even the intonation of his voice, would adapt themselves to the make-up of the people around him. With children he was their playmate, to family people – a wise counselor, to pundits – a well of knowledge, to yogis – the God of will, the God of victory. He saw himself in them and they saw themselves in him and their hearts would be bound to his feet in everlasting love. All who came to see him would be charmed by his love and kindness, beauty and wisdom, and the overwhelming sense of unity he radiated like fire radiating heat. To some he would grant a special vision, invisible to others; with some he would openly discourse. Crowds would gather round him and each one would see him differently. Even his pictures differ. A stranger would not guess that they are all of the same person. In daily life he avoided all distinction. At work and at food he was one of us. But in the hall, seated on the sofa, he was the great Lord of Kailas, the Holy Mountain. Whenever Bhagavan would enter or leave the hall, we would all get up respectfully. One could see that he did not like so many people being disturbed because of him. Once Bhagavan had jaundice. He had to be put on a fruit diet, but he would not eat fruit unless all ate, and in equal quantities too! Where could we get such a lot of fruit? Yet he was adamant and would leave his share untouched unless he saw an equal share on everybody’s leaf-plate. Those who say that a sick man needs special food and must not give trouble, miss the point. 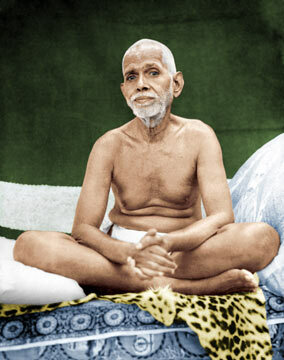 Bhagavan was not sick. His body had jaundice, that was all. He wanted to impress on our minds that under no condition must a man have a greater share. Our learning this lesson was more important to him than the cure of his jaundice. With time he ceased working in the kitchen, but we could still find him in the dining hall. When all would leave after food, he would linger on his seat and we would collect around him and chat and listen to his precious words. He would teach us and guide us and we would forget the years that passed and be again the happy crowd of yore. We were women, simple and uneducated. It was our love for him, a reflection of his love, that chained us to his feet and made us stay. For him we gave up hearth and home and all our earthly ties. We only knew that we were safe with him, that in some miraculous way he would take us to our goal. He himself was our goal, our real home. More than that we did not know or care. We were even slow to learn the lesson of equality to man and beast which he was so anxious to teach us first. To us he alone existed. 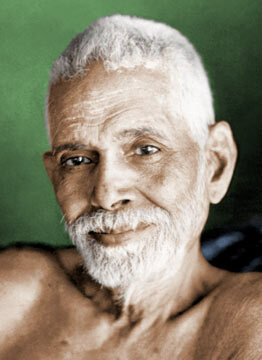 The radiant form of Ramana was enough for us. We did not know that it was not enough, that a human soul must learn to embrace the universe and realize its own presence in every living being. We would concentrate too much on him and resent his compelling us to enlarge our little circle. Although physically he is no more with us, he still directs us, as in the past. He will not let go his hold on us until we reach the Other Shore. This is our unshaken faith. We may not always be conscious of his guidance, but we are safe in his hands. Sri Krishna, in His mercy became a cowherd to teach simple milkmaids the way to salvation. Similarly Bhagavan, the same supreme Being in another form, took to cooking in order to save a few ignorant women. With his eyes he served his devotees the food of the spirit, with his hands-the bread of life. Source: Maharshi Newsletter Nov / Dec 1991, Vol.1 No.6. (As I Saw Him series). Please note that I selected only certain excerpts from the original and did some edits and added pictures of Bhagavan Ramana to the article. Grace! Jaya Sri Ramama! Immense gratitude dear Harsha for sharing this most beautiful account of Sri Bhagavan Maharshi by Varanasi Subbalakshami. Am blessed. Thank you Trina-ji. I love the stories of the devotees and it is wonderful to share them. could you compile all such stories into a pdf file which can be downloaded ? 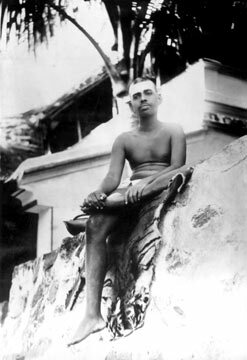 This is a beautiful and inspiring article on SriRamana Bhagavan by Varanasi Subbalakshmi as she saw him. Could you please give some more information on her life. Would be very grateful and thankful.